Using ESO's Very Large Telescope Interferometer, astronomers from France and Brazil have detected a huge cloud of dust around a star. This observation is further evidence for the theory that such stellar puffs are the cause of the repeated extreme dimming of the star. R Coronae Borealis stars are supergiants exhibiting erratic variability. Named after the first star that showed such behaviour, they are more than 50 times larger than our Sun. R Coronae Borealis stars can see their apparent brightness unpredictably decline to a thousandth of their nominal value within a few weeks, with the return to normal light levels being much slower. It has been accepted for decades that such fading could be due to obscuration of the stellar surface by newly formed dusty clouds. This 'Dust Puff Theory' suggests that mass is lost from the R Coronae Borealis (or R CrB for short) star and then moves away until the temperature is low enough for carbon dust to form. If the newly formed dust cloud is located along our line-of-sight, it eclipses the star. As the dust is blown away by the star's strong light, the 'curtain' vanishes and the star reappears. RY Sagittarii is the brightest member in the southern hemisphere of this family of weird stars. Located about 6,000 light-years away towards the constellation of Sagittarius (The Archer), its peculiar nature was discovered in 1895 by famous Dutch astronomer Jacobus Cornelius Kapteyn. In 2004, near-infrared adaptive optics observations made with NACO on ESO's Very Large Telescope allowed astronomers Patrick de Laverny and Djamel Mékarnia to clearly detect the presence of clouds around RY Sagittarii. This was the first direct confirmation of the standard scenario explaining the light variations of R CrB stars by the presence of heterogeneities in their envelope surrounding the star. However, the precise place where such dust clouds would form was still unclear. The brightest cloud detected was several hundred stellar radii from the centre, but it had certainly formed much closer. But how much closer? To probe the vicinity of the star, the astronomers then turned to ESO's Very Large Telescope Interferometer. Combining two different pairs of the 8.2-m Unit Telescopes, the astronomers explored the inner 110 astronomical units around the star. Given the remoteness of RY Sagittarii, this corresponds to looking at details on a one-euro coin that is about 75 km away! The astronomers found that a huge envelope, about 120 times as big as RY Sagittarii itself, surrounds the supergiant star. But more importantly, the astronomers also found evidence for a dusty cloud lying only about 30 astronomical units away from the star, or 100 times the radius of the star. 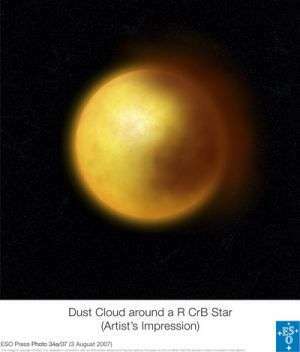 "This is the closest dusty cloud ever detected around a R CrB-type variable since our first direct detection in 2004," says Patrick de Laverny, leader of the team. "However, it is still detected too far away from the star to distinguish between the different scenarios proposed within the Dust Puff Theory for the possible locations in which the dusty clouds form." If the cloud moves at the speed of 300 km/s, as one can conservatively assume, it was probably ejected more than 6 months before its discovery from deeper inside the envelope. The astronomers are now planning to monitor RY Sagittarii more carefully to shed more light on the evolution of the dusty clouds surrounding it. "Two hundred years after the discovery of the variable nature of R CrB, many aspects of the R CrB phenomenon remain mysterious," concludes de Laverny.